Slice mushrooms and grill over gas or charcoal, or on a stove-top griddle until mushrooms are tender. Melt butter in a nonstick l0-inch skillet over medium heat. Add one flour tortilla; scatter half the cheese on top. 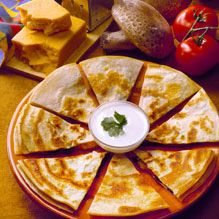 Top with the mushrooms, remaining cheese and the other tortilla. Cook for one minute, or until bottom tortilla is golden brown. Flip and cook for another minute or longer until cheese melts. Cut into 8 wedges. Top each wedge with a dollop of yogurt.